Chevrolet is GM’s signature brand, accounting for nearly 70 percent of the company’s sales and more than half of those sales globally. 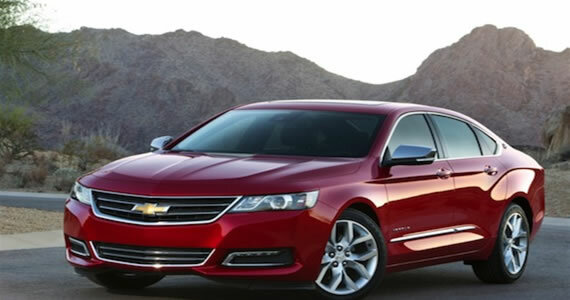 Its flagship sedan, the Chevrolet Impala is all new for 2014, a front-wheel drive model that comfortably seats five. This 10th generation model is the most advanced one yet, completing an important styling turn around that began more than five years ago. The iconic Impala is the best-selling vehicle in its segment a position it has held for 10 years running. The new model provides a more muscular frame, one that reflects positively on the bow-tie brand and complements existing models such as Camaro and Malibu. Impala competes against the Ford Taurus, Dodge Charger, Nissan Maxima, Toyota Avalon and Hyundai Azera. The 2014 Chevy Impala features a long, proportioned hood with projector-beam headlamps, a broad grille and wide swept corners. Its sculpted body lines are what you would find on today’s luxury sedans, demonstrating that Chevrolet is placing emphasis on passenger comfort. A shortened deck lid gives the sedan a sporty persona, but that look does not come at the expense of the 18.8 cubic feet of trunk capacity. Inside, the cabin is bright, well appointed and spacious. Chevrolet makes much use of soft touch materials and bright work trim to convey a premium look and feel. The Impala’s dual cockpit interior is in stark contrast to the more sedate layout previously offered, and features a sporty instrument cluster and an integrated 4.2-inch color display. An 8-inch touch screen navigation system occupies the center stack, an arrangement that includes Chevrolet MyLink with higher end models. The Impala’s frame is stiffer, a move that improves handling and ride. The cabin is quieter than the outgoing model, with noise cancellation technology and sound deadening materials shouldering much of that task. Narrower A-pillars and an instrument panel placed lower help bring in more natural light, the seats offer improved bolstering and firmer surfaces. The new Impala offers three engine choices including its first-ever four cylinder engines. Your choices include a 3.6-liter V-6, making 305 horsepower at 6,800 rpm and 264 foot-pounds of torque at 5,300 rpm. A 2.5-liter four cylinder delivers 196 horsepower at 6,300 rpm and 186 foot-pounds of torque at 4,400 rpm. Later in the model year, a 2.4-liter four cylinder engine will be available with a special edition eAssist model, a partial hybrid. This model makes 182 horsepower at 6,200 rpm and 172 foot-pounds of torque at 4,900 rpm. Notably, it is expected to achieve a segment leading 35 mpg. Every Impala engine is paired with a six-speed Hydra-Matic automatic transmission. The 2014 Chevrolet Impala sits on a 111.7-inch wheelbase and measures 201.3 inches long. This sedan is 73 inches wide and 58.9 inches tall. Its front track measures 62.2 inches, its rear track comes in at 62 inches. Front head room measures 39.9 inches to 37.4 inches in the back. Front legroom is 45.8 inches to 39.8 inches in the rear. Front shoulder room is 57.9 inches to 56.9 inches in the rear. Front hip room is 54.9 inches to 54.1 inches in the rear. Total passenger volume is 105 cubit feet. This model has a towing capacity of 1,000 pounds and it comes equipped with a 18.5-gallon fuel tank. Choose the eAssist model and towing is not recommended; a 15.8-gallon fuel tank is standard. Justin Smith is an avid blogger and contributor to ChoiceApplications.com, a leading fleet management software company in the trucking industry. One Comment on "All New Chevrolet Impala Elevates the Bow-Tie Brand"